Quite simply a very classy, big-sounding Strat with a classic 'modded vintage' vibe. Protruding saddle screws; lack of spec and colour options. 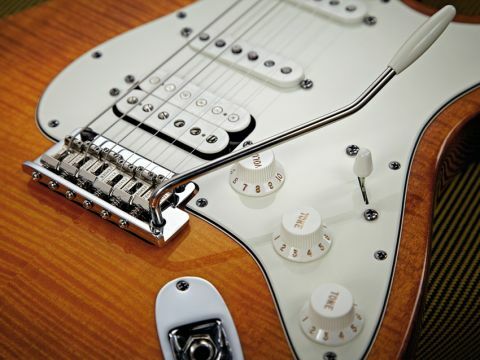 The Select Strat's two-post vibrato has vintage-style bent-steel saddles. The Select Strats have the same compound-radius 'board as the American Deluxes. The Select Strat HSS's stagger-height tuners are locking. The Select Stratocaster HSS is a different beast to the previous range-topping American Deluxe Strat. Yes, we have the compound-radius fingerboard and the staggered locking tuners of the Deluxe, but we don't get the S-1 switching, the Noiseless pickups or indeed the 'passing lane' switch (bridge pickup, no tone control). "The bridge humbucker is dramatically different, much more rock-ready, fuller and thicker, but so are the single-coil voices. " "We eschewed all that in favour of great, lightweight, gorgeous instruments with all of the elegant simplicity of their familiar ancestors intact," remarks Fender's marketing director, Justin Norvell. As a result, the HSS is a simpler guitar to use: the three pickups are controlled in fairly standard fashion with a five-way lever switch, master volume and two tone controls. The two-post vibrato has graced many a non-vintage Stratocaster yet here, unlike the block saddles of the Deluxe, we have old-school bent-steel saddles and the arm screws in without any tension adjustment - a prime example of this stated 'old-style upgrade' vibe of the Select Series. But it's in the wood choice that things change more dramatically. The neck here is birdseye maple, and with a nice dark vintage tint it looks very classy. There's a Select Series medallion inset into the back of the headstock while the front logo is very standard. The alder body, centre-jointed and nicely grain-matched, is more standard fare but it is topped with a thin (under 3mm) flamed maple facing. It's going to have less impact on the guitar's sound than the thicker maple tops used by many and again, its quite dirty-looking Antique Burst finish is posh but classically cool too. It's all finished in nitrocellulose, another difference from the Deluxe Series, and everything bar the satin-finished neck is gloss. The alder of the body has a mid-brown hue, the maple top, much like the neck, is a more golden-tinted amber. Fit and finish is of a typically high standard and subtle features such as the chamfer-edged heel and round-cornered neckplate again illustrate the upmarket vibe. While we have behind-the-nut truss rod adjustment, there's no micro-tilt for quick neck-pitch adjustment. "We went with a non-tilt configuration, for enhanced wood-on-wood contact in the pocket for tone and sustain," explains Norvell. Using our '62 Road Worn Strat as a reference certainly illustrates that the Select HSS is no vintage-spec clone. Overall it has more fullness; obviously the bridge humbucker is dramatically different, much more rock-ready, fuller and thicker, but so are the single-coil voices. There's an added thickness that gives cleans added depth and gained tones more body. Yet it's still a Stratocaster, as evidenced by plenty of percussion from the single-coils and the hum-cancelling neck/middle mix with that familiar hollowed complexity. The solo middle single-coil sounds less in your face; the bridge/middle mix is less 'definitive Strat', and as we've said the bridge humbucker is a game-changer suiting a much broader and easier to dial in gamut of rock, higher-gain blues and jazzier fusion tones. The slightly flatter fingerboard certainly suits more complex lines and once we had tweaked both set-ups, we were more than happy with the overall playability: fast but still with some fight. The vibrato too seems nicely in-tune and overall there's quite a classic modded-Strat feel, less 'new' perhaps than the Deluxe. As a middle ground between vintage and the more modern Deluxe specification, the Select fits in well. This early example did suffer from a couple of issues, not least sharp protruding height adjustment saddle screws, which felt a bit too vintage for us. Also, the Strat's tone controls - in terms of the look, feel and sound - seem standard despite the no-load specification. But there's no doubt that the Select's beefier sonic range will find its admirers.